"How can one create when all one has to do is appear?" American pop culture critic and music historian Greil Marcus after attending a 1972 Elvis concert in Oakland makes a keen observation. With these words the booklet of "Breathing Out Fire" of the new (and very active) Madison label starts. It's an eight-page booklet written by Johnny Savage who is well known for his reviews of Elvis imports. It's illustrated with a bunch of color photos and I must say the artwork of this Madison release is just fabulous. One of the best artworks ever, including the RCA-releases. The concert however, is not Elvis' best. He did 158 shows in 1974 alone and isn't at his most intense here. Still, the show is very decent and way better than e.g. the Maryland show on September 28 1974. Elvis is indeed more focused and a lot less chatty. The matinee show at the University Of Dayton is available from a mixing board tape on Fort Baxter's 4x CD set "A Profile - The King On Stage Vol. 2" . "Breathing Out Fire" captures the evening show. 13.500 fans see Elvis perform 'See See Rider', the usual show-opener, followed by the medley 'I Got A Woman/Amen'. Surprisingly, there is almost no 'wells' at the beginning of it. But, as usual, Elvis let J. D. Sumner do the bass part twice. After decent renditions of 'Love Me', 'If You Love Me Let Me Know' and 'Fever' it is time for 'Big Boss Man' which is done very well. Then Elvis announces 'Love Me Tender' by saying 'I like to sing a little bit of my first movie which was 'Love Me Tender' for you.' Elvis runs through 'Hound Dog', 'The Wonder Of You' and 'Blue Suede Shoes' before he starts with the band introductions. There are solos for James Burton, Ronnie Tutt and Duke Bardwell. Glenn D. Hardins solo leads into 'Lawdy, Miss Clawdy'. After the band introductions Elvis gives pretty standard versions of 'All Shook Up', 'Teddy Bear / Don't Be Cruel' and 'Heartbreak Hotel'. Then it's time for deep bass gospel singer J. D. Sumner and The Stamps Quartet with 'Why Me Lord?'. Elvis sings in the choruses and jokes throughout the song. It's a great version with the backing vocalists doing a fantastic job. One of the highlights of the evening follows as Elvis plays the acoustic guitar on 'That's All Right' and 'Blue Christmas'. 'I have a lot of people that ask me if I still play the guitar and the answer is no I mean, uh, yes I can!' Elvis claims. He backs up those words and treats us with a great version of Arthur Crudups 'That's All Right'. 'Let Me Be There' is present here with reprise as is the most requested song from the movie 'Blue Hawaii', the 'Hawaiian Wedding Song'. Elvis jokes about the conclusion of the song to backing vocalist Kathy Westmoreland; 'The whole ending was wrong, it wasn't romantic enough, we have to re-shoot it'. Thus follows a reprise of the song. Lead guitarist James Burton plays his red Fender Stratocaster guitar at 'Johnny B. Goode' like it's the last time ever he's on stage. 'Can't Help Falling In Love' ends the show as usual. Elvis had enjoyed himself this evening and without a doubt the audience too. The sound on "Breathing Out Fire" is fair. It's a soundboard recording, but certainly not the best there is out there. Before the show starts with 'See See Rider' you will hear a noise. It's not part of the show and therefore not a great introductory of this release. At the beginning of the song 'Blue Christmas' the sound changes which is a pity. All in all, I still think this release is well-worth having. Elvis is in good mood, his voice is strong and the sound is fair. What else could we ask for? 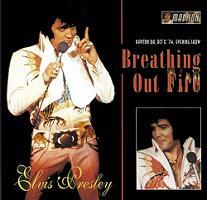 "Breathing Out Fire" is an awesome CD; it may not be Elvis' best show, but to me it is very special because I was there! Although I don't remember song for song, I do remember a few because to me they were a surprise. 'See See Rider' I recall because - of course, it was the first (I remember being so nervous; after all I was seeing the greatest entertainer the world will ever see). The biggest surprise for me was 'Big Boss Man'. I never expected that song and it is one of my favorites. I remember thinking to my self how great this was. It was almost like Elvis knew this was one of my favorites and was playing it for me (remember I was only 9 years old). The only other songs I remember are 'Lawdy Miss Clawdy', 'Blue Christmas' and Can't Help Falling In Love'. 'Lawdy Miss Clawdy' and 'Blue Christmas' are both favorites of my mother and she was pretty exited to hear them (especially 'Blue Christmas'). I must say I was pretty bombed out when 'Can't Help Falling In Love' came on (not because I don't like the song but because I knew that was it!). Next to my daughter being born; that night in Dayton was the greatest night of my life.